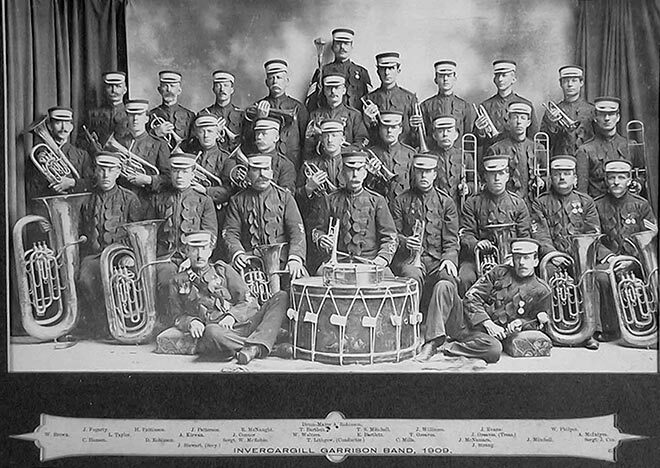 The Invercargill Garrison Band is shown in 1909, with conductor Tom Lithgow standing in the centre behind the band. In 1908 Lithgow asked his brother, composer Alex Lithgow, for a test piece for the 1909 South Island championships being held in Invercargill. Alex rearranged a piece he had written earlier and dedicated it to his home town as the 'Invercargill march'. It was first performed at the 1909 contest, and went on to become one of the most internationally popular brass-band tunes.